Configuration requise: Loan Calculator Pro 5.0 est compatible avec iPad812-iPad812, iPhone6-iPhone6, iPhoneSE-iPhoneSE, iPhone5-iPhone5, iPodTouchSixthGen-iPodTouchSixthGen, iPhone7Plus-iPhone7Plus, iPad23G-iPad23G, iPadAir2Cellular-iPadAir2Cellular, iPadAir3-iPadAir3, iPad834-iPad834, iPad71-iPad71, iPadAir2-iPadAir2, iPadPro97-iPadPro97, iPadFourthGen-iPadFourthGen, iPad72-iPad72, iPhoneXS-iPhoneXS, iPhone6Plus-iPhone6Plus, iPadThirdGen-iPadThirdGen, iPad2Wifi-iPad2Wifi, iPadThirdGen4G-iPadThirdGen4G, iPadPro-iPadPro, iPadMini5-iPadMini5, iPhone7-iPhone7, iPad611-iPad611, iPadMini5Cellular-iPadMini5Cellular, iPadMiniRetina-iPadMiniRetina, iPhoneXR-iPhoneXR, iPadProCellular-iPadProCellular, Watch4-Watch4, iPadMini4Cellular-iPadMini4Cellular, iPhone5s-iPhone5s, iPadAirCellular-iPadAirCellular, iPad76-iPad76, iPhoneX-iPhoneX, iPad74-iPad74, iPadAir-iPadAir, iPadFourthGen4G-iPadFourthGen4G, iPad612-iPad612, iPhoneXSMax-iPhoneXSMax, iPhone4S-iPhone4S, iPhone8-iPhone8, iPadMini4G-iPadMini4G, iPadMini-iPadMini, iPadMiniRetinaCellular-iPadMiniRetinaCellular, iPadMini3Cellular-iPadMini3Cellular, iPad75-iPad75, iPadAir3Cellular-iPadAir3Cellular, iPad878-iPad878, iPhone8Plus-iPhone8Plus, iPhone6sPlus-iPhone6sPlus, iPhone6s-iPhone6s, iPad73-iPad73, iPad856-iPad856, iPodTouchFifthGen-iPodTouchFifthGen, iPhone5c-iPhone5c, iPadPro97Cellular-iPadPro97Cellular, iPadMini3-iPadMini3, iPadMini4-iPadMini4. Android et Windows Phone sont pris en charge pour accéder à cette page via flatforms. Loan Calculator Pro is an easy to use financial calculator. 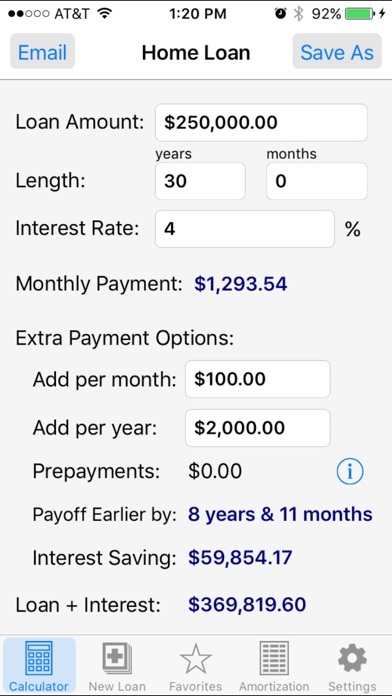 Within seconds, you will be able to calculate the monthly payment for different types of fixed rate loans such as home mortgage, auto, and credit card. You can calculate "what if" scenarios to determine how additional monthly and yearly payment will help you to pay off your loan earlier and save money in interest. In addition, you can use Loan Calculator Pro to track all your extra payments at any amount and at any point in the life of your loan. See how much interest you will save and how early you will pay off your loan by entering extra payment amounts per month and/or per year. 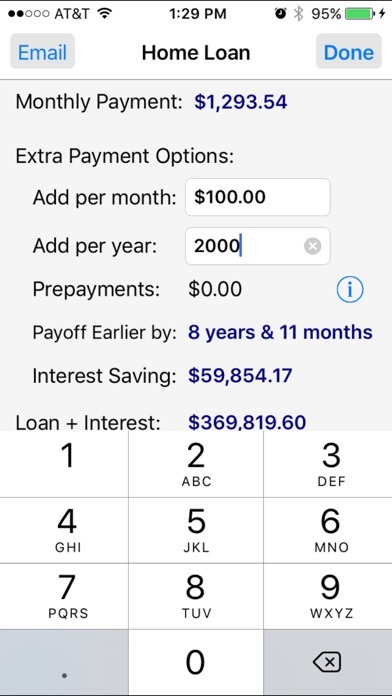 - Loan Calculator Pro will let you track all of your extra payments in variable amounts throughout the life of the loan. For example, it will let you track an extra $100 in principle on the first payment, an extra $300 on the 5th payment, and an extra $1000 one the 10th payment, etc. This way, the application will still be useful long after you have purchased your property and will let your know exactly where you are with all your loan payments. - Loan Calculator Pro is designed to be fast. 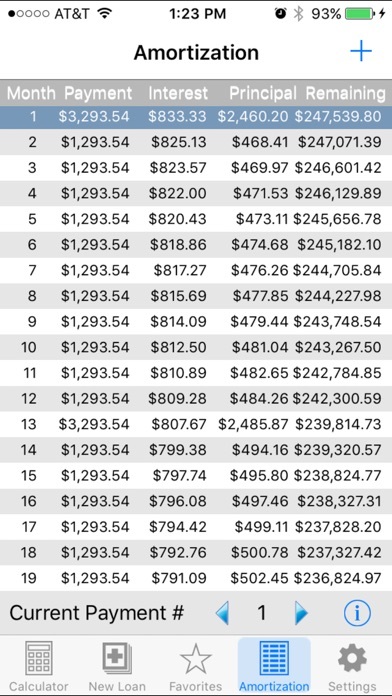 Calculations are done instantly after you enter each amount field. - The large keypad allows for easier, faster, and more accurate entry of numeric amounts. - A complete payment schedule allows you to view the amount, interest, principal, and remaining balance for each and every payment of the loan. 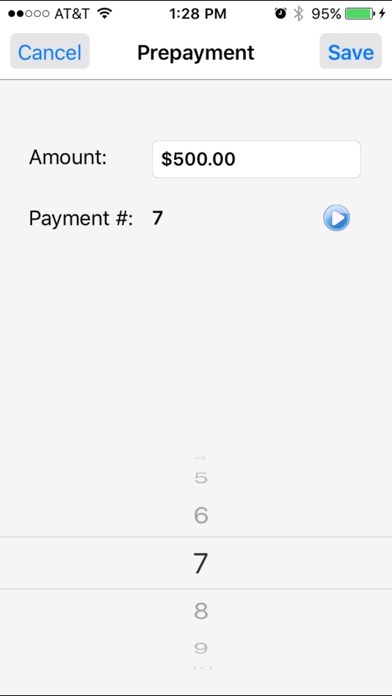 - You can bookmark the current payment you are at in the amortization table and the application automatically scroll to the memorized payment the next time. 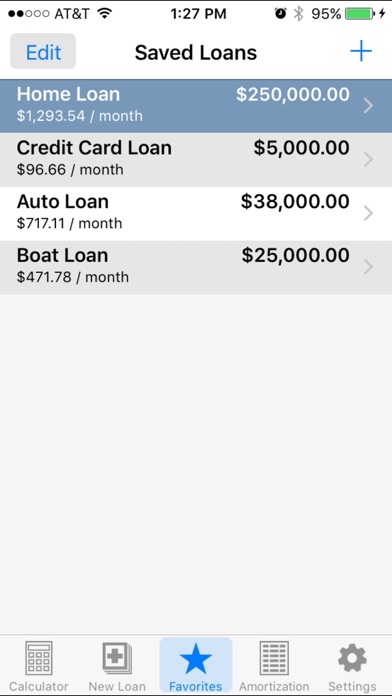 - Loan Calculator Pro lets you save and organize all your various loans in a list so you do not have to enter the information over each time. It will also remember and opens up the last saved loan you worked on. - You can reorder the loans from the saved list in any order you choose. - Export loan information and payment schedule via email. - Passcode protection to keep your loan information private. - Backup your data to your computer for safekeeping. Then restore it to your iOS device when you need to via the iTunes file sharing interface. - Special attention was given to the user interface to ensure that it is clean, intuitive, and easy to use.